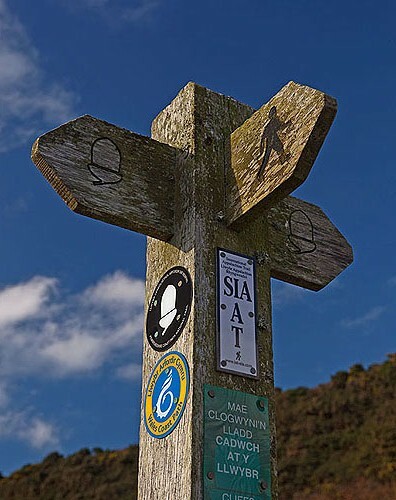 The (IAT) waymarker joins the Wales Coast Path ,on a sign post near Pwllygranant Cove. The aim of the International Appalachian Trail (IAT), Sentier International des Appalaches (SIA), is to establish a long-distance walking trail that extends to all geographic regions once connected by the “Caledonian–Appalachian Mountain” range, formed more than 250 million years ago on the super-continent Pangea . The path now passes through Canada, Greenland, Scotland ( June-2010 , The West Highland Way ) and from October 2010 - The Pembrokeshire Coast Path. The IAT is an extension of the grandfather of mammoth hikes, the Appalachian Trail – (1922-1937) from Springer Mountain, Georgia to Mount Katahdin, Maine, United States , which is over 2,150 miles long and passes through 14 of the Eastern American States.